On 1 May this year, MPs from across the major UK political parties, agreed in the UK Parliament to support a ‘Magnitsky’ amendment to the Sanctions and Anti-Money Laundering Bill. The amendment was adopted without a vote and was described by the Foreign Secretary, Boris Johnson, as “an important moment” that would “allow the UK to act against those responsible for serious offences worldwide”. The amendment was unopposed when the Bill returned to the House of Lords, and has since received Royal Assent. So, what is this new piece of legislation? So-called ‘Magnitsky’ laws are a developing international trend towards ensuring accountability for individuals around the world involved in gross human rights violations. The legislation is named after Sergei Magnitsky, a Russian lawyer and whistle-blower, who investigated alleged corruption in Russia. The amendment to the Sanctions and Anti-Money Laundering Bill will allow the UK to impose sanctions such as asset freezes and travel bans on those accused of gross human rights abuses. There is growing international interest in looking into links between corruption and human rights violations. A unique empirical analysis of the impacts of corruption on human rights was launched by the Universal Rights Group (URG) and Kroll in Geneva on 22 May, making a strong case about the correlation between corruption and violations of individual human rights. The analysis presented convincing data showing that corruption, especially grand corruption, may be one of the most important obstacles to the enjoyment of human rights around the world, and by extension to the realisation of the 2030 Agenda for Sustainable Development. Corruption can have devastating impacts on individuals’ access to a range of basic services stemming from human rights obligations, such as education, housing and water, but it also undermines the whole functioning, credibility and legitimacy of State institutions, the rule of law and ultimately the State itself. Despite these linkages, corruption and human rights tend to be considered in parallel by separate processes. In the anti-corruption sphere, the UN Convention against Corruption is strongly focused on the criminal law perspective. If implemented effectively, it has powerful potential for prosecuting the perpetrators of corruption, but it is not designed for addressing the victims of those criminal acts. The UN human rights system, on the other hand, with its focus on individuals, does have the potential to bring that dimension to life. Mechanisms of the Human Right Council, the expert Committees which monitor the human rights treaties, and the HRC Special Procedures recommend steps for governments to take to address impediments to human rights, and act as a channel for victims to report alleged violations. Many of the policy areas these mechanism cover are central to anti-corruption efforts in a country, to ensure functioning state institutions based on the rule of law and to look at realisation of rights to essential services, including those looking at the independence of the judiciary, extreme poverty, education and health. State failure to provide essential services, because of corruption in institutions and service delivery, can constitute human rights violations. By joining up our thinking on human rights and corruption, we could foster more practical action on the ground in our common fight against injustice, exclusion and impunity. These two communities share so much in common in terms of objectives and experiences. At heart, they both have a common purpose – to confront injustice. That injustice tends to be felt by the poorest sections of society more harshly. Both communities face the challenges of turning formal commitments into practice, and of confronting authority, whose interests may be served by preserving the status quo. It is time that we join forces to face these common obstacles, and move from promise to practice to help the most disadvantaged and to shift intractable interests. So how could we use the human rights mechanisms better to do this? First, by providing a forum or platform for human rights experts and anti-corruption experts to come together, to share good practices and lessons learnt, and to consider – together – how we can ratchet up and further strengthen our common response to corruption. Second, we need to learn from State experiences which have successfully adopted a human rights based approach to tackling corruption, to help other States faced with similar challenges, that request UN support, to replicate that success. There is much talk in Geneva about improving the Human Rights Council’s work on technical assistance and capacity building, which is an obvious vehicle for providing such help. Third, we should consider how to integrate a human rights and corruption perspective into the Council’s evolving work on prevention. As the URG report points out, corruption is often both a root cause and a consequence of serious human rights violations and, ultimately, of conflict. Norway, Switzerland, Sierra Leone and Colombia are already doing some very important work putting the Council’s prevention mandate into operation. These questions will be the focus of the upcoming expert workshop on anti-corruption and human rights, in Geneva on 11 June. 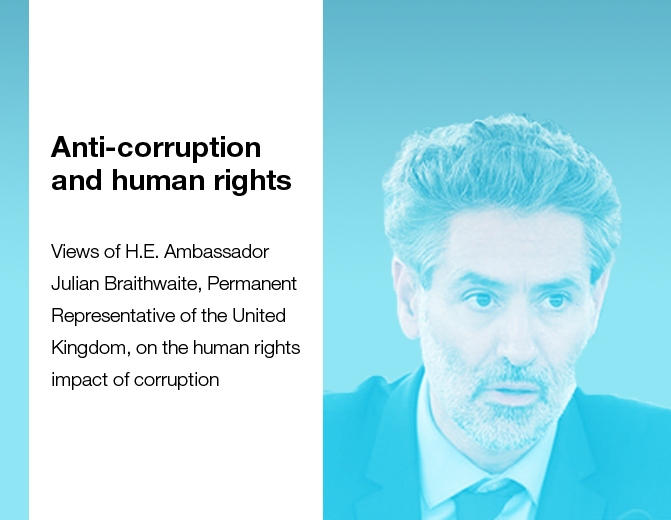 Member states, UN representatives, national mechanisms, CSOs and business will identify opportunities for linking anti-corruption measures with efforts to promote and protect human rights and consider the challenges countries face in fighting corruption. I am hoping that these discussions will contribute to new ideas on how the Human Rights Council and the wider UN system can help States adopt a rights-based approach in their anti-corruption efforts. Responding, in a meaningful way, to human rights violations caused by or linked to corruption is vital to fight impunity, to secure redress for victims, and to promote non-recurrence. This will take time. But the evolution of ’Magnitsky’ laws, in the UK and elsewhere, offers great promise in the fight against both corruption and human rights violations.